For now, the Elite x3 stands alone as the embodiment of Microsoft's PC-as-phone vision. 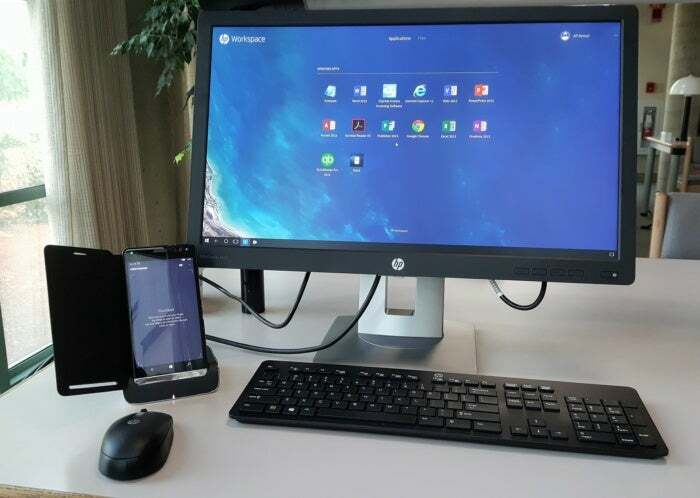 HP’s Workspace: Wow, Win32 apps on your phone! Updated October 10, 2017: So much for that. 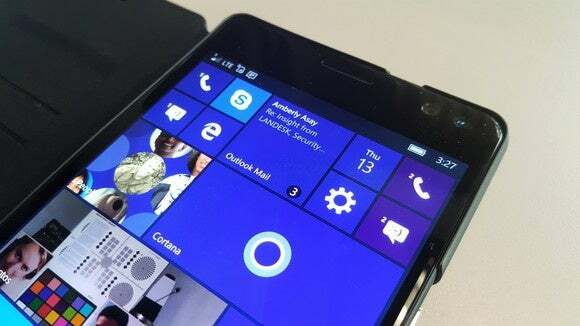 HP has decided to discontinue the Elite x3 after Microsoft put Windows Mobile into maintenance mode. HP’s Elite x3 smartphone has achieved at least one thing: It has triumphantly realized Microsoft’s dream of phones that could eventually replace your PC. Microsoft’s vision was meaningless unless those phones could support the PC’s legacy apps. Microsoft’s Continuum feature already allows you to connect a mouse and keyboard, giving the phone the look and feel of a desktop PC. 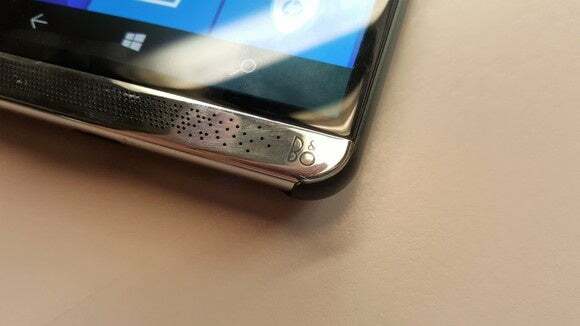 HP designed the Elite x3 to evolve that concept. Pick any Win32 app you’d like—Photoshop, AutoCAD, even Chrome—and HP’s new Workspace feature will allow it to be run via your phone. Combine that with stellar battery life, truly useful utilities, and an (almost) elite set of hardware specs, and you indeed have a PC in your pocket. It’s a pity, then, that all this comes at a very elite, PC-like price. These costs relegate the Elite x3 to corporate use, where an IT department foots the bill. 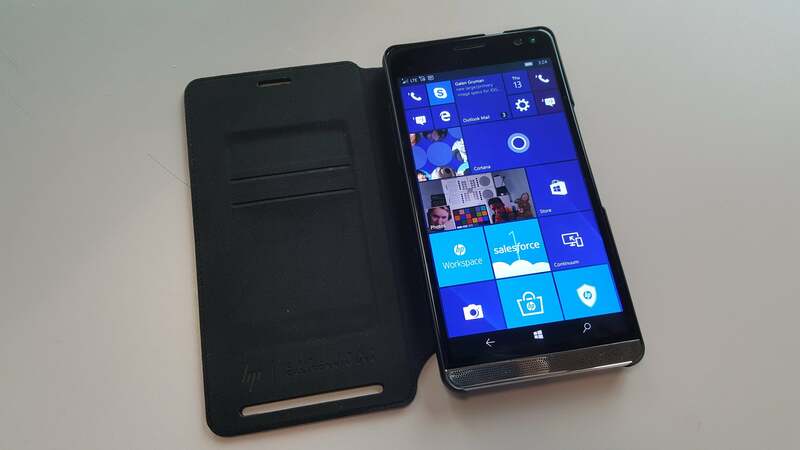 HP’s Elite x3, within its billfold case. Let’s begin our tour of the Elite x3’s formidable specs with perhaps the largest number of all: its price. 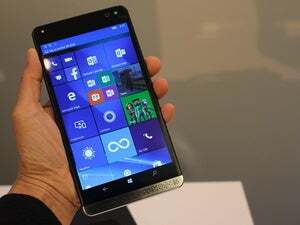 I’ve always been a fan of large phones like the Nokia Lumia 1520 and the Samsung Galaxy Note series, but the Elite x3 pushes the limits of the “phablet” designation. The phone’s $699 price is well north of affordable—recall that we dinged the competing Acer Liquid Jade Primo for its $649 price tag (it’s currently $449 in the Microsoft Store). HP’s Desk Dock adds Continuum capabilities for another $150. Then there’s the upcoming ultrabook-like Lap Dock, which at $500 brings the total bill to $1,299—just for the hardware. Gulp. The phone itself is enormous as well: 6.3 x 3.29 x 0.3 inches, weighing a sturdy 6.9 ounces. Though the Elite x3 is slightly narrower and shorter than Nokia’s massive Lumia 1520, both phones are just too large for me to use with one hand. The Elite x3’s certainly larger than Microsoft’s own flagship Lumia 950XL as well as the Acer Liquid Jade Primo. The Elite x3’s 5.96-inch, 2,560x1,440 AMOLED display has the same specs as the Lumia 950XL’s, but it pushes more pixels than the Liquid Jade Primo’s 5.5-inch, 1920x1080 display. Fortunately, it’s also protected by Corning’s Gorilla Glass 4, and unlike any other Windows phone, is both IP67 water-resistant and MIL-STD 810G drop-resistant, too. 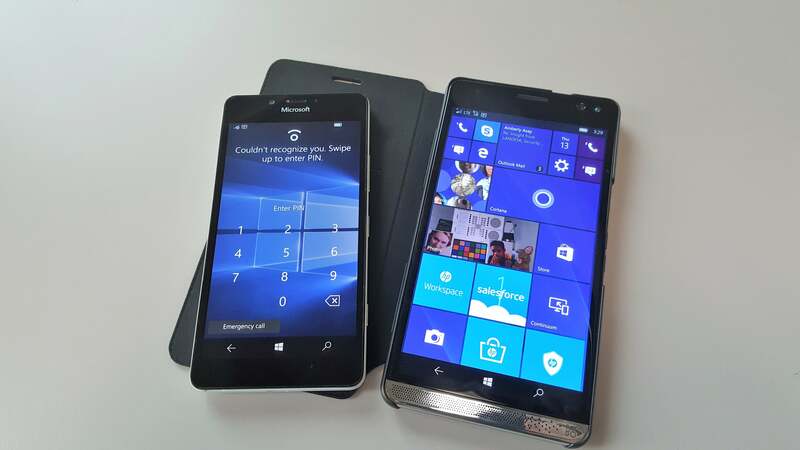 The HP Elite x3 is far larger than Microsoft’s Lumia 950, to the left. If Microsoft had made this phone, it probably would have settled for midrange hardware to keep costs down. HP, though? Hell no. With a 2.15GHz, quad-core, Qualcomm Snapdragon 820 and an integrated Adreno 530 GPU, the Elite x3 opened apps without a hint of lag, and transitioned smoothly from one task to another. The Elite x3 is also the only Windows phone with 4GB of RAM as well as 64GB of internal storage. The Lumia 950XL and Liquid Jade Primo both include 3GB of RAM and 32GB of internal storage. An SD card slot allows up to a theoretical 2TB of expansion, though that slot is shared with a second SIM. Other noteworthy features include 2x2 802.11ac Wi-Fi for better wireless reception, plus Bluetooth 4.0LE and Miracast. The phone also offers NFC, making the Elite x3 theoretically compatible with Microsoft’s tap-to-pay Wallet app -- though HP told us that that feature hasn't been enabled. There’s a 3.5-mm audio jack, too. We reviewed a dual-SIM model of the Elite x3. One of those SIMs can be used to hold an SD card, with capacity up to a terabyte. You may recall that I’m a huge fan of Windows Hello, the quick and easy way Windows recognizes you and logs you in. The Elite x3 does something few, if any, other phones do: it lets you log in via Hello with two biometric authenticators—an iris scanner and fingerprint reader. Both are competent, if not entirely predictable. Waking up the phone involved holding it with my finger over the reader, hoping that either it or the iris scanner logged me in—and they almost always did. The Elite x3 includes front-firing speakers from Bang & Olufsen, though I didn’t hear much difference from the flat sound other smartphone speakers generate. HP’s Elite x3 sets a new benchmark for performance among Windows phones. 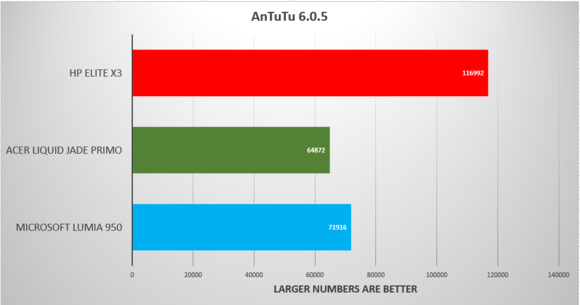 We’ve also broken out the AnTuTu benchmark on the three Windows 10 phones to offer a more direct comparison. 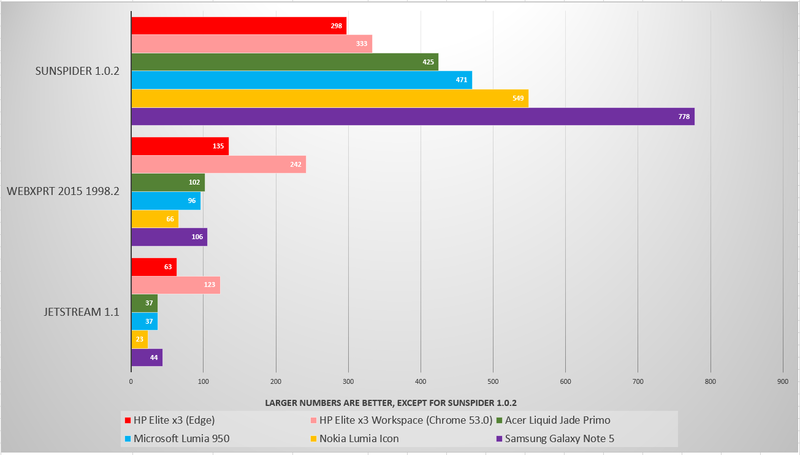 The Elite x3 enjoys a sizable lead over its competition. Battery life is another major plus for the Elite x3. Inside the phone is a massive (though, sadly, unremoveable) 4,150 mAh battery, with far more capacity than either the Galaxy 6s Edge (3,600 mAh), iPhone 7 Plus (2,900 mAh) Lumia 950XL (3,340 mAh) or Acer Liquid Jade Primo (2,870 mAh). In just 10 minutes, the Elite x3’s quick-charge technology will fill the battery by 14 percent, good enough for a 2.5-hour call. The Elite x3 looped a 4K test video repeatedly for an incredible 9 hours and 23 minutes, compared to just under 6 hours for the Acer Liquid Jade Primo. It’s clear that this is an all-day phone, and more. I also spent some time with the Elite x3’s camera, which, like Acer’s Liquid Jade Primo, is one area where HP seemed to cut corners. If you were hoping that the Elite x3’s 16MP rear and 8MP front-facing cameras would emulate an iPhone, say, with a pair of dual lenses, you’ll be disappointed. C’mon HP, what’s an extra few bucks for a great camera? From top left, clockwise: studio lights, at full brightness; half brightness; lamplight, and lamplight with flash. Our studio has a white background. 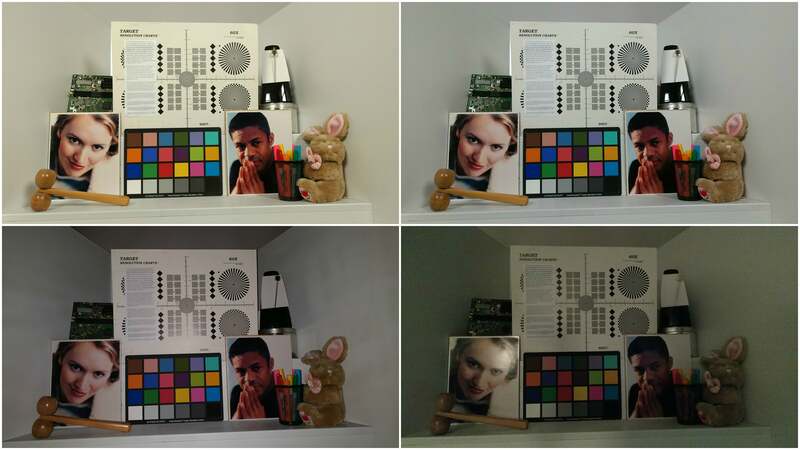 The test photos revealed a substantial flaw that had nothing to do with image quality: the time from which the camera icon was pressed to the time the picture was taken measured about a second. It hearkens back to the bad old days of Windows phones, where excellent color reproduction was marred by slow shot times. Optical image stabilization wasn’t included, either. In my mind, the Elite x3’s camera ranks above the Liquid Jade Primo’s but below the Lumia 950’s. 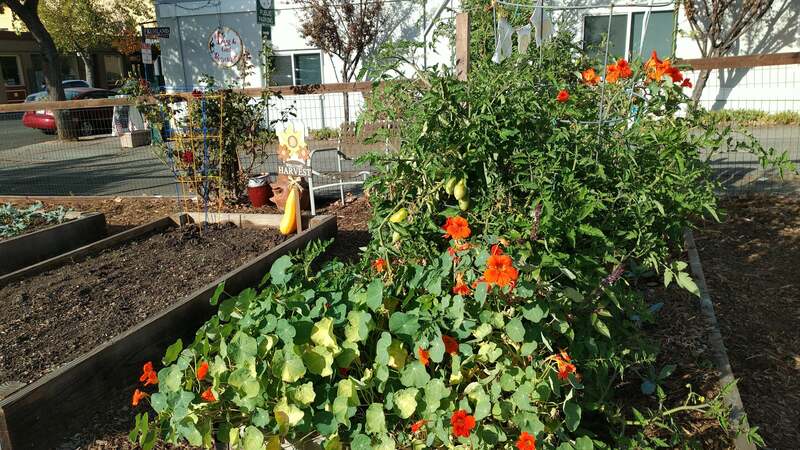 An outdoor shot taken by the Elite x3 on a late afternoon in October. If the Elite x3 were an iPhone or an Android phone, we’d essentially end the review right there. The true advantage of Windows phones, however, is the Continuum experience, which allows a docked Windows phone to serve as a slightly degraded version of a desktop PC. HP over-engineered the Continuum experience with the same attention to detail as its other aspects, and on the Elite x3 it shines brightly. 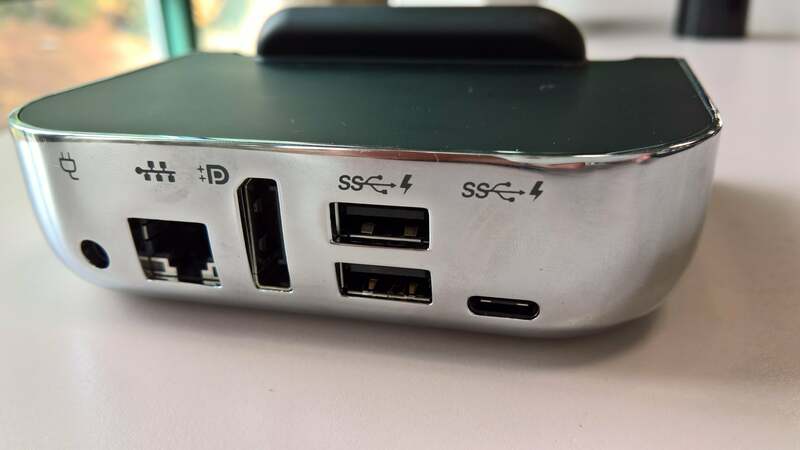 HP’s Desk Dock, which includes the full complement of ports. 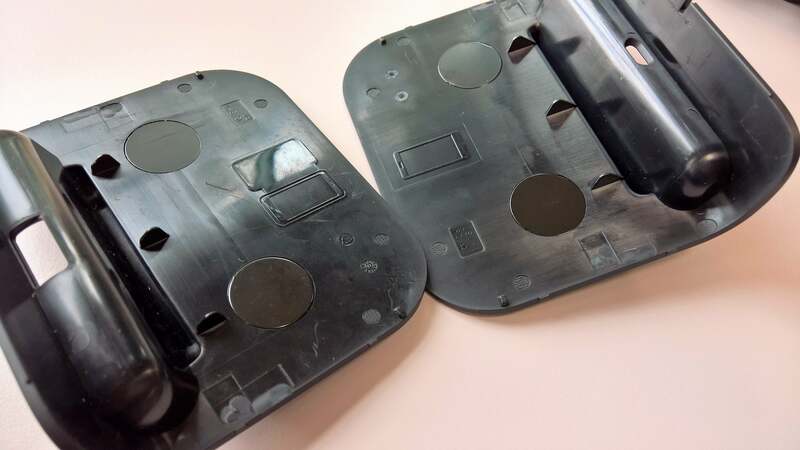 Let’s begin with the wedgelike Dock, a scant pound’s worth of plastic and aluminum which could literally stand in as a weapon in a game of Clue. With two USB 3.0 ports as well as a USB-C port (which can be used for charging), the Elite x3 dock means business. In fact, the dock’s commitment to productivity extends to the display connector—a full-sized DisplayPort connector, rather than the more common HDMI. 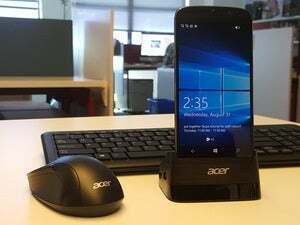 I criticized Acer’s Liquid Jade Primo because if you used its bundled case, the phone wouldn’t fit into the dock. HP’s thought of that—oh boy, has it ever. 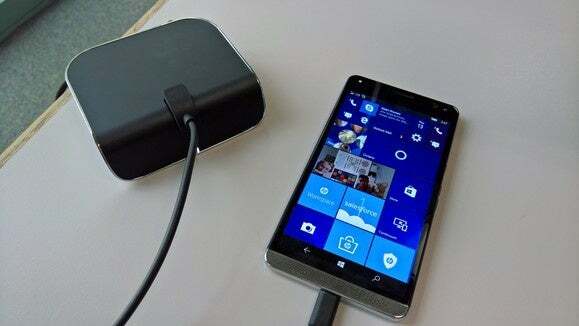 HP’s Elite x3 includes three sleeves that magnetically slide over and on top of the dock: one designed to fit the bare phone, one designed to dock the phone within HP’s billfold case, and a third that adds an extension cord so you can hold it in your hand while still using the phone’s touchpad to navigate. The Desk Dock’s sleeves identify how it’s to be used: case, or no case. Connecting the phone via the dock works well. But the real innovation here is the wireless connection. All of the previous iterations of the wireless Continuum experience I’ve used ranged from laggy to downright unusable, partly because of the Miracast wireless technology that connected the two. HP’s Elite x3 uses Wi-Fi to connect the phone to your computer’s display, extending its range but also significantly reducing latency to just a smidge. In fact, the only lag I really noticed was from the phone itself, slowly loading pages over a wireless connection. If you want to be able to stand and interact with the Elite x3, there’s an “extension cord” sleeve, too. Unfortunately, HP didn’t provide us with one of the key accessories for the Elite x3: the Lap Dock. Essentially, it’s an improved version of the NexDock, a “dumb” ultrabook that’s powered by your phone. 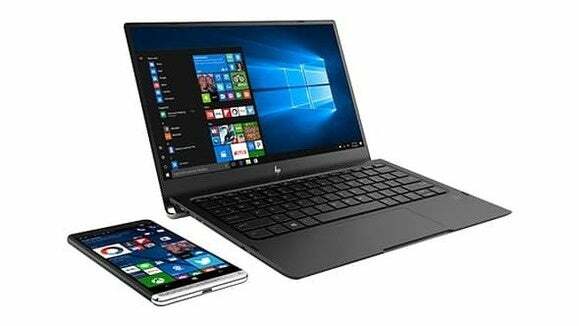 In HP’s case, the Lap Dock is a 2.3-pound, laptop-like device with a 46.5-Whr battery, three USB-C ports, and a 12.5-inch 1080p display. It eliminates the need to carry your mouse, keyboard, and Display Dock on trips. HP’s Elite X3 Lap Dock will ship Nov. 14 from the Microsoft Store. Normally, we’d be concerned with a smartphone maker who bundled additional apps with the phone. With the Elite x3, however, HP bundled an impressive selection of ten useful utilities, totaling a scant 4.4GB, and most of them uninstallable. An HP Mobile Hardware Diagnostics app tests nearly every component for failure. HP’s Device Hub app does what Microsoft should: provide a one-stop shop of your device info, with links to the user guide, regulatory and warranty information, and more. HP’s Display Tools will override Windows’ own settings to keep your screen from dimming or turning off when docked. 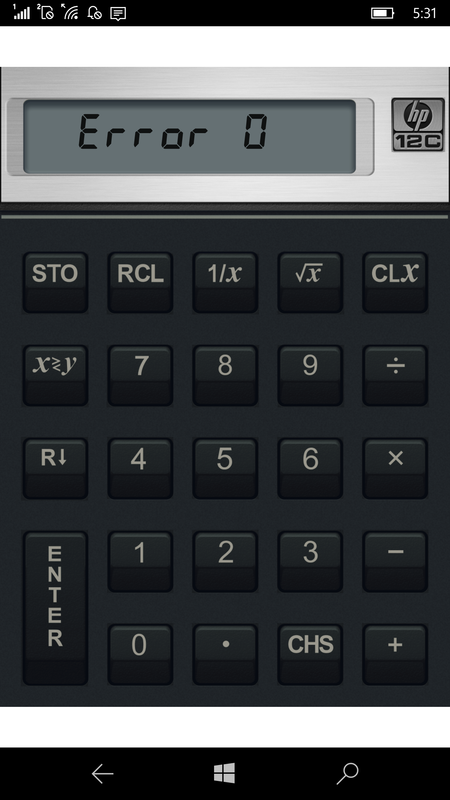 HP’s throwback calculator app is an Easter egg of sorts. You might find the included WinZip and Salesforce apps unnecessary, as well as an app to control HP printers. “HP Picks,” though, provides a nicely curated list of business apps on the Microsoft Store. And then, of course, there’s Workspace, HP’s gateway to virtualized Win32 apps that live in the HP cloud—and the entire reason to buy this phone. Workspace makes your phone your PC—for real. Say what you will about Continuum, or how well HP has implemented it; you’re still at Microsoft’s mercy. And because Continuum only supports Microsoft’s relatively new UWP apps, there’s a vast body of apps that you simply can’t use: browsers like Microsoft’s Internet Explorer or Google Chrome, graphics apps like AutoCAD, or collaboration apps like HipChat. Project Centennial may be bringing older Win32 apps to the Windows Store, but progress has been slow. HP’s Workspace app opens up your phone to pretty much whatever Win32 app you have a license for, and ask HP to load into the Workspace cloud. Workspace, meanwhile, can run these legacy apps in a virtualized cloud environment, just like they’re on your PC. Though Citrix and its competitors have offered these capabilities to PCs and thin client devices for years, it’s still a novel experience for phone users. Unfortunately, an expensive licensing process overshadows what could be a transformational experience. Workspace is available in two tiers: Essential ($579 per year, per user, or $49 per month) and Premium ($939 per year, per user, or $79 per month). A year of VPN integration costs extra: $2,995. Each account tier comes with 24-hour support during the five-day workweek. There’s no easy way to load individual files in Workspace. HP encourages you to store documents inside third-party cloud services, which are accessible as virtual drives from within the apps. HP manages the installation of the apps you choose in its cloud. The Essential tier allows up to 10 apps; Premium users can select as many apps as they would like. HP runs the apps on a virtual CPU and dedicated memory (4GB or 8GB, depending upon the tier) and interacting with them remotely. Workspace has its own file directory, though it’s not really clear whether it’s there to be accessed by users. Workspace was generally pleasant to use, even if it had its own little quirks. Not surprisingly, HP forces you to use Workspace in conjunction with a dock. HP supplied a login and password, which I had to manually enter each time. 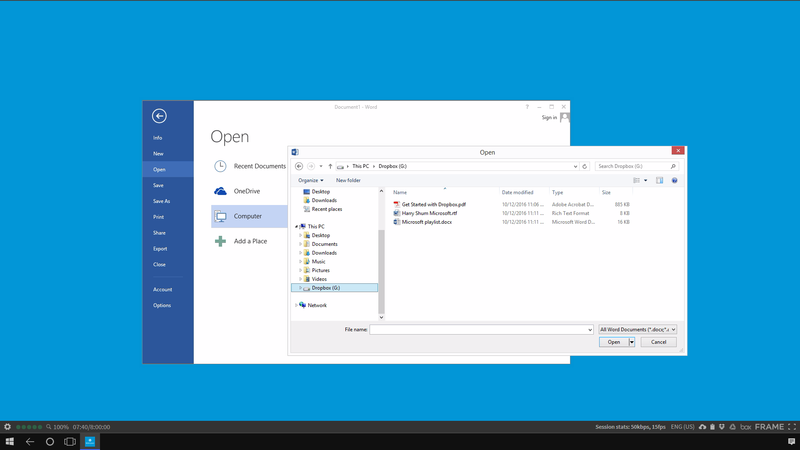 Workspace also encourages you to store files in cloud storage services like Box, Dropbox, or (soon) OneDrive. (HP does not supply any cloud storage within Workspace itself.) But there’s no obvious way to actually access a Word file stored in Box unless you’re in Word. 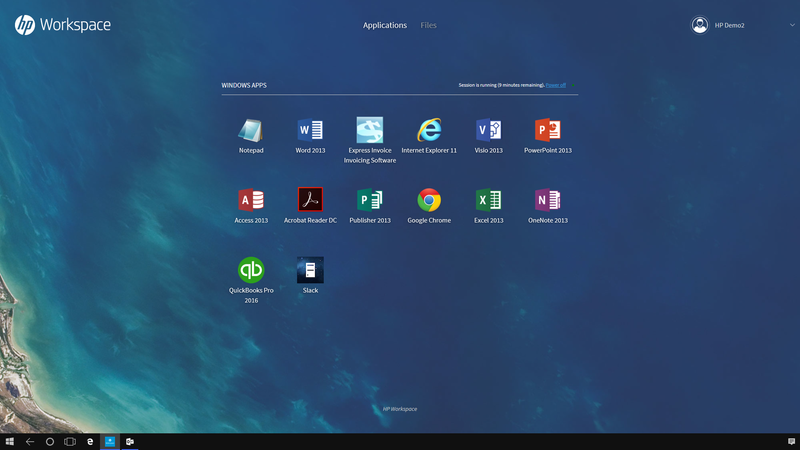 Once logged in, Workspace let me use more than a dozen apps that HP seeded for my use, including Chrome, Internet Explorer, Slack, the full versions of the Office 2013 apps, and even Notepad.